It is debatable whether the Beogram CD 50 or the Beogram CD X was the first B&O compact disc player. A prototype CD 50 was certainly shown first, in the 1985 catalogue. However, in detail this machine was clearly different from those which would finally become available over a year later, by which time the CD X was also included in the range. The CD 50 was the first CD player to be integrated into a system (Beosystem 5000) however, and the first to include Datalink, and thus remote control. Text copyright © Beocentral. Unauthorised reproduction prohibited. The CD 50 was styled to match the rest of Beosystem 5000 perfectly, and only the cut in the front panel that divided the drawer cover from the rest of the fascia gave away which of the 5000 system components was the CD player. A discreet “compact disc” logo was also added in the black part of the front, but this was small enough not to spoil the lines. Text copyright © Beocentral. Unauthorised reproduction prohibited. CD was still a developing format in 1986, but even so, some of the CD 50’s features were unusual. Firstly, the disc had to be loaded label side down, unlike most other domestic players (Pioneer autochangers being a notable exception). This was done because of fears that laws may be passed in America making an upward pointing laser illegal, though in the end of course this never happened. The lack of controls was also odd for the time, the only functions that could be accessed from the machine were on/close/play, advance 1 track, display mode shift (track, index, track time, total time) open and standby. Of course integration with Beosystem 5000 made the full range of functions available, including intro-scan and programming during playback, a most unusual feature. The prototype CD 50 even offered “peak search” for cassette recording, but this feature was not included on the production model. Users who wished to add a CD 50 to other systems could have a remote control receiver fitted, then the machine could be used with the special CD Terminal remote control. This remote control terminal could be adapted to switch other Beomasters (e.g. 3000, 6000, 8000) on and off too, though the Datalink system only worked with the Beomaster 5000 and later CD equipped models. Text copyright © Beocentral. Unauthorised reproduction prohibited. Technically, the CD 50 was a Japanese machine. The cabinet and control system were B&O, but the playback mechanism and electronics were all mounted in a separate and imported subchassis. The manufacturer was never disclosed, though input from the likes of Aiwa, Matsushita and Yamaha is clear upon inspection. As such, a 3-beam laser pickup was used, driven along on a sled by a rack and pinion. 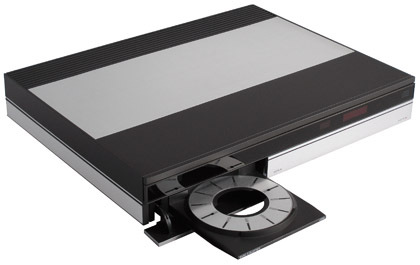 This contrasts with the Philips single-beam radial machines that formed the basis of all other Beogram CD players until the end of the 1990s, though in the end the 3-beam system would return in later versions of the BeoSound Ouverture and subsequent models. The CD 50 included a full 16 bit decoder, unlike the CD X which only used 14 bits. A remarkable feature of the decoder was that unlike the CD X and all other Beogram CD models, only one digital to analogue converter (DAC) was used for both channels. To provide stereo playback, a very fast electronic switch was used to switch the analogue (music signal) output of the DAC alternately between the two channels, over 86,000 times a second. This is very similar to how FM stereo radio works. This was of course followed by complex high-order filters to remove the noise that this sort of arrangement inevitably generated, and despite sounding unpromising on paper, the arrangement yielded very good results. The DAC itself was made by Burr-Brown, an American manufacturer normally associated with high quality industrial devices which are seldom seen in domestic equipment. Text copyright © Beocentral. Unauthorised reproduction prohibited. The CD 50 arrived mid-way through the life of Beosystem 5000, so not all systems sold included one. As if to demonstrate the way history repeats itself, the replacement for the Beogram CD 50, the Beogram CD 5500, was also delayed, so early examples of the Beosystem 5500 were sold with CD 50s. The Beogram CD 5500, when it did arrive, was a very different machine, based around Philips technology and made by B&O themselves. Text copyright © Beocentral. Unauthorised reproduction prohibited.